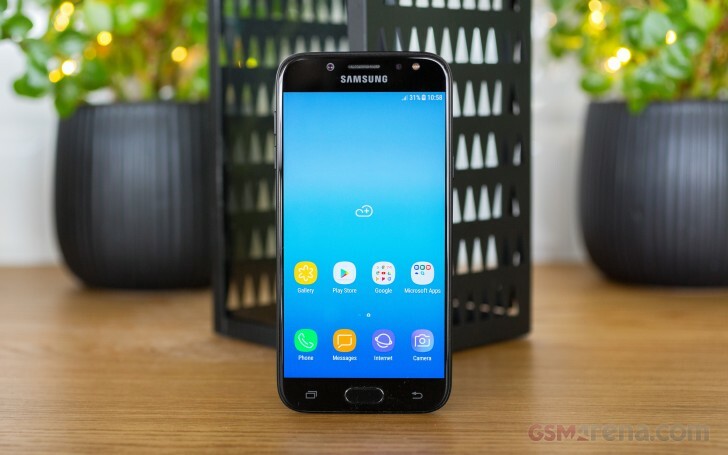 Samsung has fitted the Galaxy J5 (2017) with a 5.2-inch 720p Super AMOLED display - same as the one in last year's model, if going solely by the numbers. The pixel density is 282ppi, but the fact that it's a diamond pixel arrangement with half the number of blue and red subpixels means you'd be able to see the weave of pixels if you look closely. Looking at the test results, it may well be the same panel indeed. Maximum brightness isn't great at 326nits (a dozen less than the 2016 model), but in Auto the J5 (2017) can do way better. The brightness under direct light is virtually identical to what the J5 (2016) produced in Outdoor mode - the difference here is that the latest model has an ambient light sensor and can boost the brightness on its own, while you had to manually engage Outdoor mode on the J5 (2016). Our sunlight legibility test puts the 2017 model slightly ahead of its predecessor. It obviously falls short of the premium AMOLEDs but you still can't find an LCD in this class that can match the Galaxy J5 (2017) in sunlight legibility. Pretty great then. As for color accuracy, do not expect much of it in Adaptive display mode. This default setting produces noticeably blue whites and average DeltaE is 5.6 with a maximum of 12.9. The good news is that in any of the other modes the blue tint is gone. If for some reason you insist on true-to-sRGB reproduction, the basic mode can get you close to that with an average DeltaE of 3. The Galaxy J5 (2017) is sold as either a single SIM or dual SIM package though not all regions necessarily get both. Nano SIMs must be used in any case. The microSD slot is always available even if you have two SIMs inside, so you don't have to sacrifice carrier/plan flexibility for extra storage or the other way around. The LTE is Cat.6 for up to 300Mbps of downlink. The J5 (2017) comes with Wi-Fi b/g/n support in the 2.4GHz spectrum and a/n/ac over 5GHz. There's GPS with A-GPS, GLONASS, and Beidou; Bluetooth v.4.1, and an FM radio receiver. NFC is also on board with a dedicated menu in the Settings. Charging and wired connectivity use a microUSB 2.0 interface - how about a switch to USB-C across the range already! On a positive note, there's a 3.5mm jack for attaching headphones or an external amp. The Samsung Galaxy J5 (2017) is powered by a 3,000mAh battery and that's 600mAh less than the J7 (2017) but then the display here is smaller and the resolution is lower, so we expected comparable results. With screen size and resolution out of the equation in voice calls, the J5 (2017) scored 21:37h on a 3G call compared to the J7 (2017)'s 26:29h. In tests with the display on the two variables - size and resolution - made things more complicated and the numbers didn't match our expectations. In video playback the Galaxy J5 (2017) outlasts the J7 (2017) by two full hours, only to be defeated in web browsing by 4 hours. We've come to expect AMOLEDs to be much more efficient in our video test than web browsing, and that's the case with the J5 - perhaps even more so in this instance. In the end, the overall result of the Galaxy J5 (2017) is 97h in our battery test - an excellent endurance rating despite the slightly lower than projected web browsing longevity. 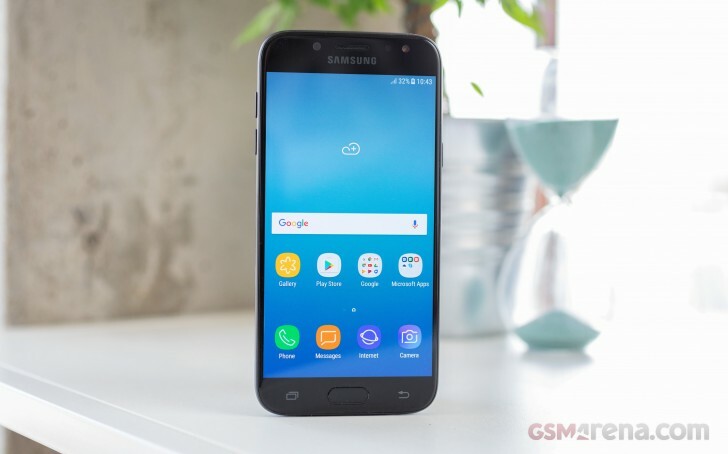 Our endurance rating denotes how long a single battery charge will last you if you use the Samsung Galaxy J5 (2017) for an hour each of telephony, web browsing, and video playback daily. We've established this usage pattern so our battery results are comparable across devices in the most common day-to-day tasks. The battery testing procedure is described in detail in case you're interested in the nitty-gritties. You can also check out our complete battery test table, where you can see how all of the smartphones we've tested will compare under your own typical use.